The Apollo Pilot XP (AL-A28) is a standard sized water-resistant alphanumeric pager with an oversized 4-line display. It includes left/right and up/down buttons for easy access to menu choices and settings. 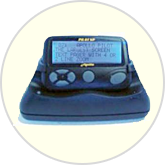 The Pilot XP LCD screen is about 25% larger than screens found on other standard sized pager models. It performs all of the same functions as the comparable Motorola and Unication products. The Pilot boasts a water-resistant, durable housing and includes a holster with a clear protective lens shield that allows viewing the screen without removing the pager from the holster. Size: 3.125" x 2.06" x .85"